Postcard US-1939267 to Germany shows President Obama greeted the audience before a campaign speech for reelection at Canyon Springs High School in North Las Vegas on August 20, 2012. He chose North Las Vegas, where foreclosures was the worst in the entire country in 2011, to highlight the need for another term for him to battle the sluggish economy. More than a year later, in his fifth State of the Union address tonight, Obama focuses on America's economic divide and inequality. Facing a divided Congress and uncooperative Republican leadership, President Obama vows to use the executive power pursue his campaign agenda and outlines modest steps, with or without the help of Congress, to help Americans left behind amid the economic recovery. 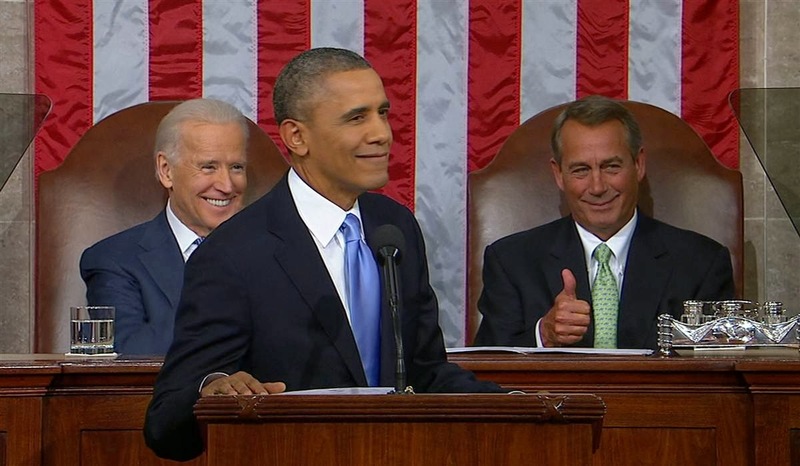 NBCNews: Speaker of the House John Boehner gives President Barack Obama a thumbs up after the president noted "how the son of a barkeep is the Speaker of the House" in an effort to highlight the opportunities available to Americans during the State of the Union address.